Cheesecake, pink chocolate, and sprinkles that shimmer… Yup, I’m all set! Cheesecake pops are so much fun, and they have party written all over them. I don’t know what it is about miniature desserts, but I just love them. These pops are great for a party and people go crazy over them. The flavor combinations are endless, and this season I’ve been doing my “in the pink” pops. I used my raspberry swirl cheesecake, dipped them in pink chocolate, and covered them in the prettiest rainbow sprinkles. They just seem to fit all the occasions happening lately from Mother’s Day, to graduations, to showers. I’ve been making them a lot recently as favors for showers, and presented in a pretty vase or mug, they make fabulous gifts. Cheesecake pops are also great when you need a fabulous dessert in a pinch. If you don’t happen to have a cheesecake on hand, and you don’t have the time to whip one up, you could use a store bought one. Don’t worry I won’t tell 😉 Once you zhush the pops up with chocolate and different toppings they will be dressed to impress, and your guests will think you are a rockstar! Have I mentioned how much I LOVE sprinkles ?! Scoop chilled cheesecake with small ice cream scoop. Refrigerate for about 30 minutes to firm up. 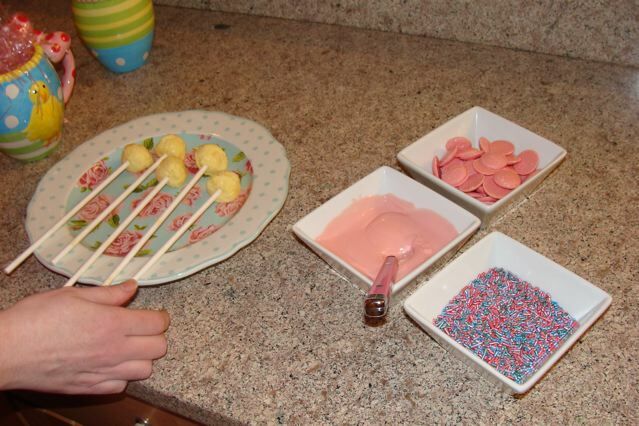 Shape each scoop of cheesecake and insert lollipop stick. Melt candy melts in microwave. Dip each pop, letting the excess chocolate drip off. >YUM! They look wonderful. LOVE the sparkly sprinkles!!! >What a great party idea. Especially for kids parties. I can see how these would be a raging success! >These are adorable! People do go crazy for anything in "pop" form. 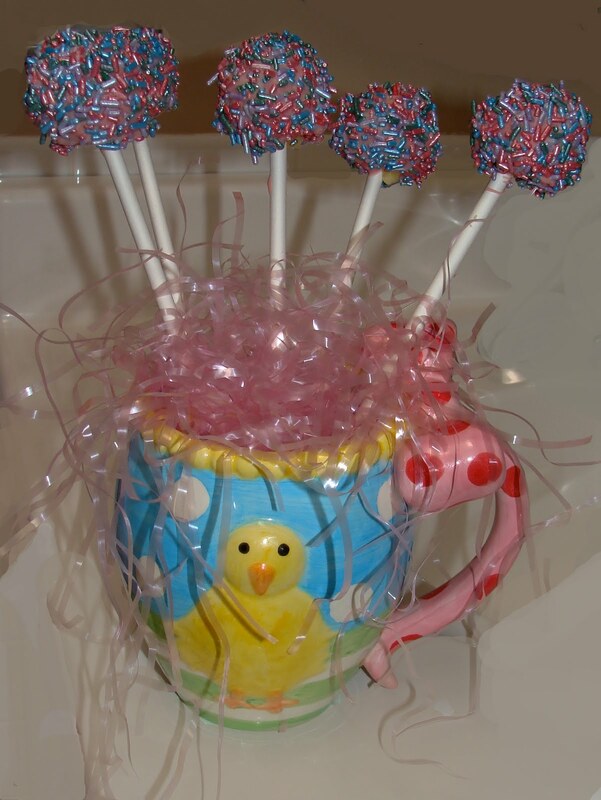 I make cake pops recently for Easter and they went over very well. I like your idea of the cheesecake pop better though! >These look perfect! When I made mine awhile ago they were dripping all over the place! >These are so cute! Bite-sized pink dessert! >They're awesome. I love those sprinkles as well. Now I need to find me some. Thanks for sharing the recipes and technique. >Wow these pops look so cute and delicious!!! >These are the most adorable little pops. Love the pretty little sprinkles on top. This would be the ultimate birthday dessert for kids' party! >Well, heck, who doesn't love sprinkles!? Especially when they're the cute holiday or seaonally themed one – I'm a total sucker for those! It's a really good thing they don't take up more room because I have more jars of sprinkles than I do spices… Have you been to this website yet? http://www.sweetbakingsupply.com/ Crazy sprinkles galore! >This is such a great idea to use cheesecake! And I loved your raspberry cheesecake post so I'm sure these are delicious! >Oh I am so loving the idea of cheesecake vs. cakey cake pops. Nice work! Also-loving all the pink! >Yum! I love these and also love the fact that you can get some of the graham cracker crust in there too (my favorite part!) I'm going to have to try these! >I love the idea of cheesecake pops over regular cake pops. Next time I have a party I will makes these! 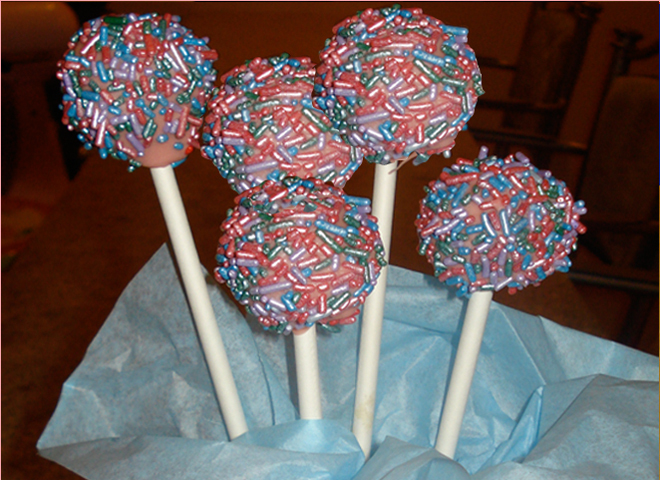 >These cheesecake pops look so elegant with those shimmering sprinkles! Like you said perfect for a shower. >Mmmm…cheesecake pops. Great idea for a quick treat. Who would not love cheesecake on a stick covered in glorious sprinkles? >Mmmmm! These look nice! 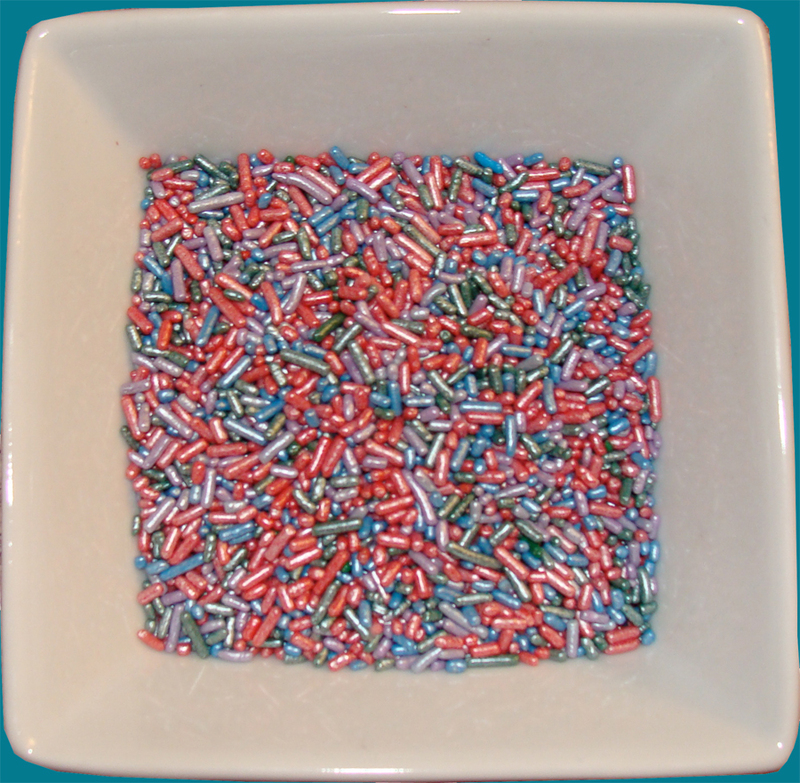 I'm thinking maybe some red, white, and blue sprinkles for 4th of July!…..I think I will! Thanks LadY! >Absolutely love cheesecake. What a great idea! I'm afraid I would eat wayy too many though..
>Great presentation! I recently did somethings similar with strawberries and I had a great time with that. >this is making me drooool….awesome presentation..
first time here..love your space..gorgeous posts..
>They are very adorable and so sparkly 🙂 Love cheese cake everything! >These are gorgeous!! They look like little jewels!! 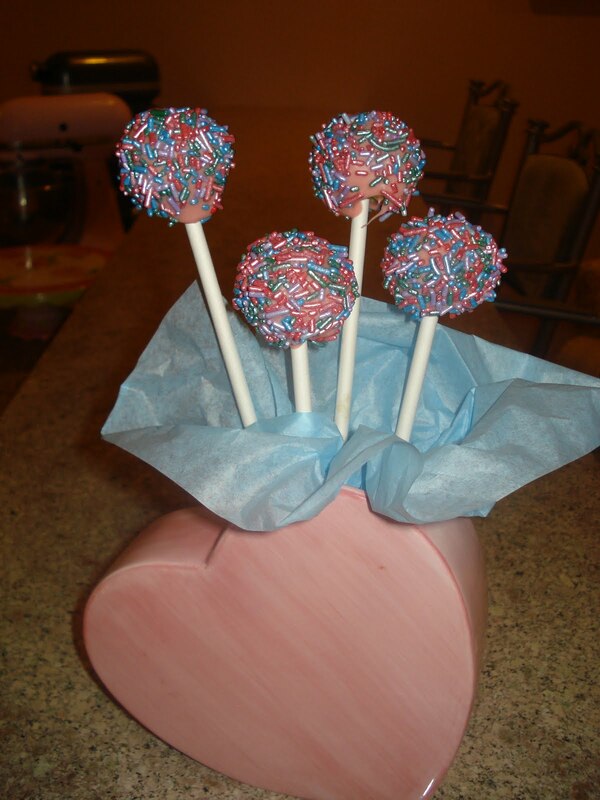 I can't wait to have a party or shower because I'm totally making these little beauties. You are so talented!! >This is truly a girly girl treat. Those sprinkles are the cutest! >My kids will love these pops. Thanks for sharing!